In my last post, I explored the large issues facing harbor seals throughout the 20th century, including competition with humans, pollution, and disease. In looking at the last decade or so, these themes continue to be important but I think that they have become more indirect in nature in some cases. Although seals still eat salmon and other valuable fish and there are regular chemical spills and disease events, there are other smaller challenges that can add up over time. And there are cases where seals and humans seem to be doing well together. Certainly the US Marine Mammal Protection Act and similar legislation around the world has made a difference for harbor seal populations– Gilbert et al. 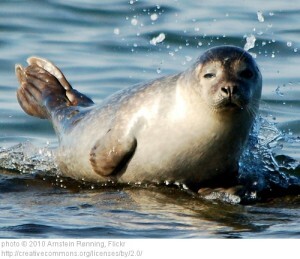 (2005) estimated that the number of harbor seals along the Maine coast increased at over 6% per year once hunting ended, and the 2004 census of harbor seals in California concluded that populations there were stable or increasing (Lowry et al. 2008). But there are still concerns about declining numbers in Glacier Bay National Park, Alaska (Womble et al. 2010) and the ~13% yearly decline witnessed in the Orkney Islands, UK between 2001 and 2010 (Hanson et al. 2013). Living alongside humans has exposed harbor seals to a variety of small disturbances which may have negative consequences. Even when we are careful about handling organochlorines, other materials discharged into our waterways (which usually find the sea at some point) are causing health problems for a host of marine mammals. 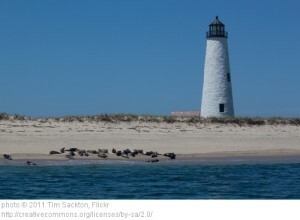 Among the bacteria found in harbor seal pups on Smith Island, Washington was salmonella which may have been introduced by agricultural run-off or sewage (Huggins et al. 2013). (And antibiotic-resistant bacteria have even been found in northern elephant seals- Stoddard et al. 2005.) Of the mass mortality events seen in marine mammals (an estimated 7-8 per year), harmful algal blooms seem to be increasing (Gulland & Hall 2007), possibly because of compounds in surface run-off or due to climate change. Why should we be worried about seal infections and algal blooms? Drug-resistant bacteria doesn’t bode well for anyone, especially if it is infectious in multiple species, and algal blooms can kill the seafood we depend on and make us sick as well. These harbor seals enjoy relaxing on the beach as much as we do. High levels of human activity can also be a problem for marine mammals. Because harbor seals haul out on land, versus ice, their favorite resting areas are sometimes our favorites, too. In areas along the West Coast with lots of people and noise, harbor seals spend more time in the water during the day and haul-out more often at night to avoid people (Acevedo-Gutierrez & Cendejas-Zarelli 2011). They also seem more sensitive to certain types of noise than other pinnipeds- unlike California sea lions who showed brief concern over the noise from Navy missile tests on San Nicolas Island, California, harbor seals usually left the area for at least 2 hours (Holst et al. 2011). (Northern elephant seals barely registered the noise levels, suggesting to me that elephant seals, like a 500-lb gorilla, sit pretty much wherever they want…) Harbor seals have also abandoned haul-out sites when levels of human presence became too great (Becker et al. 2009). Since human populations along the world’s coastline continue to grow, we can expect that harbor seals in some areas will find themselves pinched for beach space. And expanding human travel has the potential to cause issues for harbor seals in more northern locations. The growing cruise industry in Alaska means that seals and cruise ships are increasingly using the same areas- a study in Disenchantment Bay found that harbor seals were likely to escape into the water when cruise ships came within 400 m, and that 90% of seals were in the water by the time ships reached the NOAA’s 91 m guideline for ship distance from marine mammals (Jansen et al. 2010). Why should it matter if harbor seals spend more time in the water? After all, they are marine mammals. In fjords like Disenchantment Bay, where glacial meltwater mixes with sea water, water temperature ranges from 3° C to 7° C. For young (less than 15 days old) harbor seal pups who are more sensitive to cold water, increasing the portion of their day spent in the water from 40% to 50% would mean that they needed an extra 4-10% of energy per day to keep warm and keep growing. So, although harbor seal populations have benefitted from protective legislation, there are still a number of ways in which human activity directly and indirectly negatively impacts this species. And many of the issues I’ve described in my posts apply to a wide variety of marine mammals around the world. In the same way that we were able to limit over-hunting of harbor seals, we can also help clean up their environment and lessen the consequences of living side by side with us. In my final post of the month, I’ll explore ways we can get directly involved in harbor seal, and general marine mammal, conservation efforts- goodness knows that healthier, more balanced ocean ecosystems are good for us as well. Acevedo-Gutierrez, A and S Cendejas-Zarelli. 2011. Nocturnal haul-out patterns of harbor seals (Phoca vitulina) related to airborne noise levels in Bellingham, Washington, USA. Aquatic Mammals 37: 167-174. Becker, BH, Press, DT, and SG Allen. 2009. Modeling the effects of El Nino, density-dependence, and disturbance on harbor seal (Phoca vitulina) counts in Drakes Estero, California: 1997-2007. Marine Mammal Science 25: 1-18. Gilbert, JR, Waring, GT, Wynne, KM and N Guldager. 2005. Changes in abundance of harbor seals in Maine, 1981-2001. Marine Mammal Science 21: 519-535. Gulland, FMD and AJ Hall. 2007. Is marine mammal health deteriorating? Trends in the global reporting of marine mammal disease. EcoHealth 4: 135-150. Hanson, N, Thompson, D, Duck, Callan, Moss, S, and M Lonergan. 2013. Pup mortality in a rapidly declining harbour seal (Phoca vitulina) population. PLoS ONE 8: e80727. Holst et al. 2011. Responses of pinnipeds to navy missile launches at San Nicolas Island, California. Aquatic Mammals 37: 139-150. Huggins et al. 2013. Causes and patterns of harbor seal (Phoca vitulina) pup mortality at Smith Island, Washington, 2004-2010. Northwestern Naturalist 94: 198-208. Jansen, JK, Boveng, PL, Dahle, SP, and JL Bengtson. 2010. Reaction of harbor seals to cruise ships. Journal of Wildlife Management 74: 1186-1194. Lowry, MS, Carretta, JV, and KA Forney. 2008. Pacific harbor seal census in California during May-July 2002 and 2004. California Fish and Game 94: 180-193. Stoddard, R, Gulland, FMD, Atwill, ER, Lawrence, J, Jang, S, and PA Conrad. 2005. Salmonella and Campylobacter spp. in northern elephant seals, California. Emerging Infectious Diseases 11: 1967-1969. Womble, JN, Pendleton, GW, Mathews, EA, Blundell, GM, Bool, NM, and SM Gende. 2010. Harbor seal (Phoca vitulina richardii) decline continues in the rapidly changing landscape of Glacier Bay National Park, Alaska 1992-2008. Marine Mammal Science 26: 686-697. Are giraffes a big conservation story? John on You dirty rat?